The first thing I’d like to tell you today is that I have added a little more information to my previous blog entry about the difference about “each” and “every” that was published on March 24th. I hope that the new information and examples will make this clear to everyone. 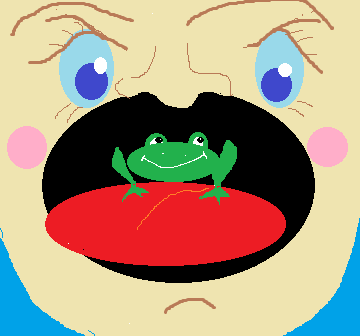 I often get a frog in my throat after I eat, so I usually drink water to get rid of it. I’d better not eat anything before my presentation. I don’t want to get a frog in my throat. A: Do you have a cold? Your voice sounds strange. B: No, I’m not sick. I just have a frog in my throat, that’s all. A: I have a bad cold now. B: Oh really? When did you get it? A: I got it the day before yesterday. I’m not exactly sure why we say we have a “frog” in our throats, but I suppose it’s maybe because we might sound like a frog when we talk with a lot of phlegm in our throats. That’s my guess anyway. Anyway, I hope you don’t often get a frog in your throat. I often do, and it’s very annoying.